In the ten years since the global financial crisis, policymakers and regulators worldwide have focused on eliminating the idea that banks were too big to fail. While effects of the financial crisis are fading, global financial regulation is set to take a new direction with a lot of movement afoot. Bank of England governor, Mark Carney, is set to step down as chairman of the Financial Stability Board which recommends financial policies to the G20. Chairman of the Basel Committee on Banking Supervision which sets global minimum bank capital policies, Stefan Ingves, is to leave his position. Jaime Caruanz, general manager of the Bank of International Settlements, is due to step down by the end of the year. The era of global consensus on strict financial sector reform is further impacted by the uncertainty engendered by Brexit on how European regulators will govern the UK once it exits the European Union (EU) as well as deregulation of financial services proposals gaining traction in the United States. Through the European Commission, the EU and its G20 partners have attempted to reform the financial sector framework. The aim was to mitigate future risk and encourage stability and transparency of the sector following the financial crisis. The European Commission set up high-level expert groups and produced the Larosière Report in 2009 and 2010. This led the way on the regulation of EU financial markets and financial institutions. The fundamental catalyst for regulatory reform is to create a safer banking sector that manages crisis prevention, early intervention and bank resolution. The reforms aim to reduce the risky activities that contributed to the global financial crisis. WHAT DOES THE FORMATION OF THE BANKING UNION MEAN FOR THE EUROPEAN UNION? The anticipated formation of the Banking Union is an attempt to restore market confidence, enhance market transparency and strengthen regulatory supervision. This will create a single rulebook for all financial institutions and market participants in the EU. This strategy has manifested in the Capital Requirements Directive (CRD IV), the Directive on Bank Recovery and Resolution (BRRD) and the Deposit Guarantee Scheme (DGS). CRD IV will enhance supervision and governance, institute policies on executive remuneration, reduce the reliance on external credit ratings and improve stability. The BRRD puts together tools and rules for banks to resolve issues in a compliant way. Thus, bank failure costs are not borne by taxpayers and governments. The DGS echoes this rationale by increasing market participant confidence and mitigating the risk of runs on the banks. 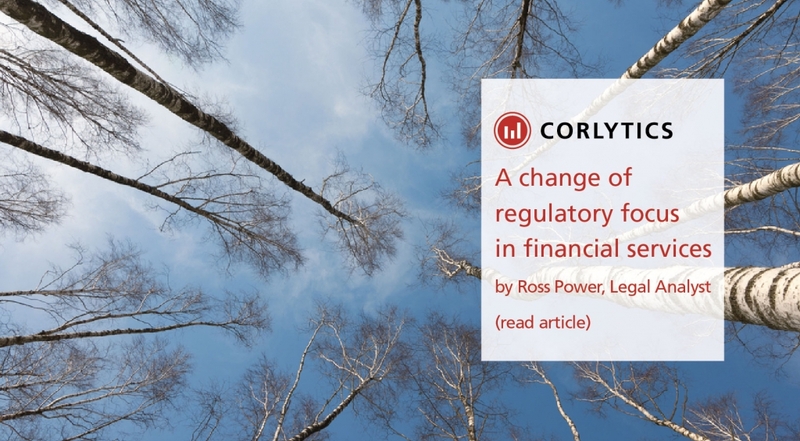 While the appetite for regulatory reform has reduced, insight from Corlytics suggests that European regulators have pivoted their focus. Regulators are now focused on assessing whether lenders have enough easy-to-sell assets to cope with market volatility. This is illustrated by the European Central Bank, who recently issued its first fine for breach of liquidity requirements to Permanent TSB Group (PTSB) in Ireland between October 2015 and April 2016. The ECB imposed a €2.5 million penalty fine for the breach. PTSB stated the breaches arose through a misinterpretation of a revised regulation. At no point during this period did the group’s actual liquidity position deteriorate. Dealing with regulations and compliance has always been a costly and far-from-hassle-free experience. These imposed reforms have changed the focus in the financial services industry. They need to be monitored to assess whether they deliver the intended aims and if they have unintended consequences. If you need assistance in understanding your own regulatory requirements, Corlytics here to help.